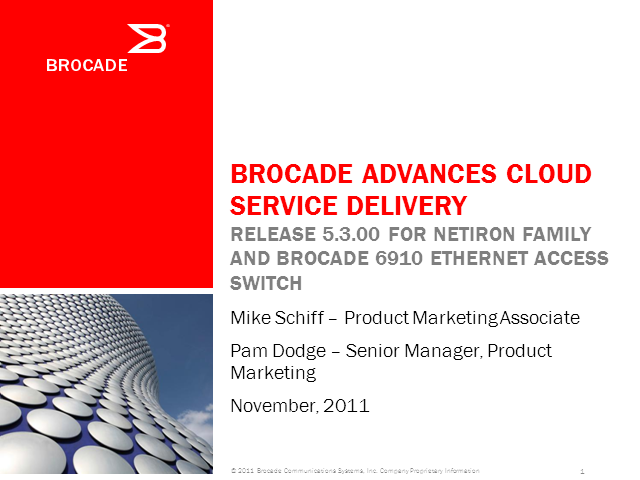 Announcing the Brocade Multi-Service Ironware Release 5.3 for NetIron Family and the availablility of the Brocade 6910 to enable service providers to build resilient, cloud-optimized networks and transform their businesses to maximize profitability and infrastructure investment. This release provides enhanced MPLS, IPv6 and Ethernet capabilities that will be added to the Brocade MLX, XMR, CER, and CES platforms for Data Centers, Service Providers Core and Metro customers. The Brocade 6910 extends the reach of service provider networks to the customer premise and wireless cell sites, streamlining the economic delivery of advanced, differentiated business services via Carrier Ethernet. Brocade application delivery product offerings address today's urgent data center requirements with the introduction of Brocade Virtual ADX as part of the comprehensive software networking portfolio, and the enhanced cloud orchestration and auto-provisioning capabilities. Brocade application delivery solution addresses urgent data center requirements with L4-7 software networking, on-demand provisioning system, and the OpenStack cloud orchestration framework. On-demand data centers require high performance hardware that can withstand the demands of mission-critical environments. Brocade introduced a new high-density 40 GbE module for the Brocade MLXe Series Routers, new NetIron CES and CER-RT carrier Ethernet compact switches and routers and new release of the NetIron Multi-Service software with support for OpenFlow Hybrid-Port Mode. Cloud-based computing will have a major impact on the way that enterprises configure their IT resources over the next several years. By 2015, one of every seven dollars spent on packaged software, server, and storage offerings will involve the public cloud model. To stay competitive in this environment, providers of cloud services will need to move quickly to create and deploy innovative and high-value service offerings. Using the network as foundation, cloud providers will need to invest in next-generation application delivery platforms. Building upon existing performance and scale benefits, application delivery platforms will be instrumental in delivering an operationally efficient, customizable datacenter network. •What are key combinations of application delivery attributes that will support agile cloud service creation? •When is the right time to invest in IPv6? •What is the role of application delivery controllers within the context SDN (software-defined networks) ? •Why is application intelligence crucial for network operators to meet the explosion of the mobile cloud? OpenFlow/SDN is emerging as one of the most promising and disruptive networking technologies of recent years. It has the potential to enable network innovation and create choice, and thus help realize new capabilities and address persistent problems with networking. It also promises to give network operators more control of their infrastructure, allowing customization and optimization, therefore reducing overall capital and operational costs. Industry is embracing SDN. Network operators plan to build their infrastructure using this innovative technology. Incumbent vendors as well as startups are developing a range of products for different market segments including data center, service provider and enterprise. With the passage of the recent D-Block legislation and funding allocation, the vision of a single nationwide Public Safety broadband network based on commercial standards can become a reality. Today, Public Safety Agencies and municipalities, in an effort to build better interoperable communication and collaboration among first responders, are building early deployments of 700 MHz public safety broadband LTE networks that will ultimately be part of this nationwide broadband network. These networks will provide responders with access to a host of media rich applications along with better interoperability among agencies through the use of their mobile and handheld devices. Learn how Motorola is teaming up with Public Safety Agencies to build this LTE backbone and how Brocade plays a role in this ecosystem by providing Ethernet access and transport from these cell sites to enable LTE connectivity. This is the second part of the three part series of Business Continuity webcast. Uninterrupted Virtual Machine mobility between data centers requires storage and IP networks connectivity to respond to very stringent requirements. Brocade storage networking solutions exceed these requirements, allowing for extended distances and better performance using Brocade FastWrite technology. Governments and telecommunication operators need intelligence drawn from real-time analysis of massive network data flows so they may be swiftly notified of key events and to take corrective action. IP networks carry enormous amounts of traffic with unpredictable behavior, and visibility into the network is becoming essential. In response, Brocade and IBM have developed a solution that combines state-of-the-art network telemetry and real-time analytics processing on an unprecedented scale. Seamless integration between Brocade MLXe telemetry-enabled devices and IBM InfoSphere Streams analytics platform enables non-disruptive extraction and analysis of massive data flows from production networks in real time. Brocade, EMC, and VMware bring you this three part series webcasts on "Business Continuity." Business continuity and application availability at all times are top requirements for any business. Brocade, EMC and VMware collaborated to test and validate a solution that offers IT Operations the capability to dynamically migrate their applications across data centers without business interruption. Network is the platform for service providers to deliver differentiated service offering and speed the latest services and applications to market. Whether you operate a fixed or mobile carrier, cable and content provider, hosting or cloud provider, you need a scalable, application aware platform that can help you build, test, deploy the requested service so you are always ahead of the game amongst the competitors. Brocade is announcing the significant software advancements to the Brocade® ServerIron® ADX Series of cloud-optimized application delivery switches designed to help customers gain greater application control and service scalability. Join us in our conversation about the revolutionary application programming platform, the scalable IPv6 enhancement, and extensible manageability that helps network operators and application delivery professionals in maintaining a large scale infrastructure to meet the demands of prevalent Internet evolution and cloud based services. Log on to www.brocade.com/adx and www.brocade.com/openscript to get connected. Brocade has extended its reach to the customer premise and cell sites with Carrier Ethernet Metro Edge Solutions. This webcast will detail how the Brocade 6910 Ethernet Access switch is playing a key role as an access device for many applications such as mobile backhaul, Ethernet Business services, and Broadband services. Funktionen wie E-Mails sind aus der heutigen Geschaftswelt nicht mehr wegzudenken. Das E-Mail-Aufkommen steigt kontinuierlich von Jahr zu Jahr und erfordert immer zuverlassigere und leistungsfahigere Messaging-Systeme. - wie Sie die Sicherheit ihrer Daten durch SSL Verschlusselungen erhohen. Christian Neumann arbeitete zunachst als Trainer in der IT, spater als Systemtechniker in einem Systemhaus und schlieslich als Consultant fur mittelstandische Kunden. Dabei erreichte er in einer berufsbegleitenden Weiterbildung die Zertifizierung zum IT-Projektmanager (IHK), einer Fachrichtung des Operativen IT-Professionals. Randolf Klaas ist seit 4 Jahren als Spezialist fur Load Balancing tatig - erst bei Foundry Networks, nach der Ubernahme dann bei Brocade. Er berat und unterstutzt Unternehmen bei der Ausarbeitung und Realisierung von unternehmenskritischen Projekten die Hardware Load Balancing erfordern. We are excited to announce the release of Brocade ServerIron ADX 1000 Fiber platform (namely ADX 1000F) that offers the flexibility of copper and fiber connectivity, as the newest addition to the Brocade Application Delivery Switch product family. This extension to the award-winning ADX 1000 series is designed to deliver customers increased choice and establish the industry benchmark for performance, scalability and investment protection for application delivery solution. Business and Technical Decision Makers of IT Infrastructure Networking, Operation, and Engineering Group who cares about high performing, cost efficient application delivery solution. What will this session cover? This session will provide a reference architecture overview and procedures for deployment of NAT64 and DNS64 in support of IPv6-only client environments. The number of address spaces used by IPv4 has been dramatically depleted. IPv6 is the new fabric of the Internet and will bring new business opportunities and business models. Jeff Hartley is a (CISSP/BCLP/BCNE), Application Delivery Technical Specialist from Brocade. Jeff specializes in the Application Delivery product line for Brocade, focusing on Service Providers and strategic initiatives. Jeff spent the prior 15+ years in Service Provider Engineering, Information Security, and Management roles, at companies ranging from start-ups (MindSpring, Purewire) to large SP (Cox Communications, Bloomberg). Stephan Lagerholm is an IPv6, DNS, DNSSEC and IT-security expert with over 11 years of international and management experience. He is a Senior DNS architect at Secure64 Software Corporation where he is responsible for the design and roll-out of complex DNS solutions to large service providers worldwide. Stephan’s background includes leadership positions at the largest networking and security system integrator in Scandinavia. He is also one of the directors at the Texas IPv6 Task Force. Why IPv6 now? What are the trends that IDC is seeing that are contributing to the growth of IPv6? We will also cover how application delivery solutions are an essential requirement for customers transitioning to IPv6. Enabling Scalable Cloud Network Services for Service Provider Orgs. Founded in 1995, Brocade is an industry leader in providing high-performance network solutions that help the world’s leading organizations transition smoothly to a virtualized world. Brocade is extending its proven data center expertise across the entire network with future-proofed solutions built for consolidation, network convergence, virtualization, & cloud computing.